Upgrade to a General Class Ham Radio License NOW! It's quick and easy with this study guide and the convenient question and answer format. 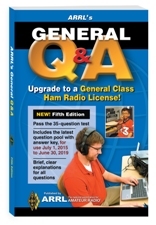 This fourth edition of ARRL's General Q & A is your authoritative guide to every question in the General (Element 3) question pool--everything you need to pass your General Class Amateur Radio license exam! Using ARRL's General Q & A is the best way to review for the exam with confidence. Upgrade and enjoy more frequency privileges today! Read and understand. Brief explanations follow each question. For more detailed explanations, turn to The ARRL General Class License Manual. ARRL's General Q&A. Kindle Edition.